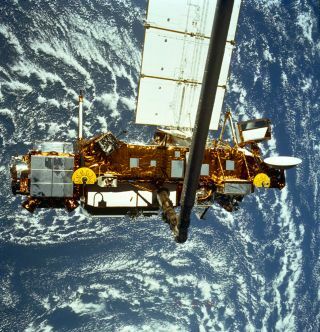 The Upper Atmosphere Research Satellite hangs in the grasp of the Remote Manipulator System during deployment from Space Shuttle Discovery, September 1991. An out-of-control satellite that's been languishing in orbit for six years is now one the verge of falling back to Earth, NASA has announced. But there's a long legacy that will end with the doomed satellite's Earthward plunge. What is the Upper Atmosphere Research Satellite (UARS)? UARS is a NASA Earth-observation satellite. The spacecraft was designed to measure ozone and other chemical compounds found in Earth's ozone layer. UARS also measured winds and temperatures in the stratosphere, as well as the energy Earth received from the sun. Together, these data helped scientists understand how the upper atmosphere affects our planet's climate. The Upper Atmosphere Research Satellite hangs in the grasp of the Remote Manipulator System against the blackness of space during deployment from Space Shuttle Discovery, September 1991. When did the spacecraft launch? UARS launched aboard NASA's space shuttle Discovery, which deployed it into orbit on Sept. 15, 1991. It was originally designed to operate for only three years. Instead, it conducted scientific research for 14 years. How high did the UARS satellite fly? During it active mission, the UARS satellite soared above Earth at an altitude of about 375 miles (600 km), according to NASA records. Its orbital path was tilted about 57 degrees with respect to Earth's equator. When did UARS end its scientific life? UARS was officially decommissioned on Dec. 14, 2005. At that point, six of its 10 scientific instruments were still functioning, according to NASA. The spacecraft made one final engine burn to lower its orbit out of the way of useful satellites, and its systems were commanded into a non-active mode. When will UARS re-enter Earth's atmosphere? It's too early to predict exactly when the spacecraft will begin its plunge to the ground, but NASA says it will likely be in late September or early October 2011. As we get closer to that time, the space agency expects to be able to predict more accurately the course and timeline of UARS' re-entry. The timing depends on variations in radiation from the sun, as well as the spacecraft's orientation as it loses altitude. It's also too soon to tell exactly where the spacecraft will fall, as that depends on the timing and trajectory of its course, which are also uncertain. However, an earlier analysis suggests that wherever UARS descends, any surviving debris will likely scatter within an area of 500 miles (800 kilometers) length. Why is it falling to Earth? Generally, satellites in Earth orbit naturally lose altitude slowly over time if they have no fuel to boost to higher orbit. The orbit of UARS has slowly decayed over the years following its deactivation, to the point that it will soon begin its final dive toward the ground, pulled in by gravity. How large is the UARS satellite? The bus-size UARS satellite is about 35 feet (10.7 meters) long and 15 feet (4.5 m) wide. How much of UARS will break up during re-entry? The spacecraft will break into pieces as it plummets through the atmosphere, but not all of it will burn up in the heat of re-entry. One analysis of the spacecraft suggests that of its total 6 1/2-ton bulk, only 1,170 pounds (532 kilograms) will survive when it reaches the ground. Will UARS pose a risk to people on the ground? Although most of the spacecraft will be destroyed during re-entry, some will survive. These pieces of debris could pose a small risk of damaging property or endangering people when they fall. "The risk to public safety or property is extremely small, and safety is NASA's top priority," NASA said in a statement. What should I do if I find a piece of UARS after its fall? According to NASA, "If you find something you think may be a piece of UARS, do not touch it. Contact a local law enforcement official for assistance." How can I learn more about UARS' re-entry as its course becomes known? NASA and the Joint Space Operations Center of U.S. Strategic Command at Vandenberg Air Force Base in California will release updates, starting with weekly missives and then daily and even more frequent notices as we approach the re-entry date. NASA is posting updates at its UARS mission website here. And of course, please check back at SPACE.com for further news as the UARS re-entry draws near.